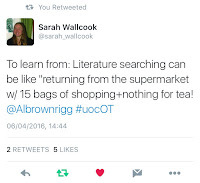 Thinking back to this time last year, at the very beginning of my research journey, I remember attending the 2nd year's dissertation research conference and feeling inspired, considerably apprehensive about the roller coaster of a journey that was to come, but excited to jump on board and get started. One year on, and I'm well on the way to finishing my research write up as part of my dissertation and it was our turn to present our findings within the MScOT Student Research Conference. There was some live tweeting throughout the conference which you can have a look at if you are interested by checking the hashtag #uocOT. You can also see a full transcript over on healthcare hashtags. I thought I would document some of my take home thoughts from the keynotes and some of the research presented within the sessions. Morning Keynote: Anna Clampin "Research and Evidence – tools for a Profession’s development?" Anna Clampin gave a brilliant keynote within the morning session, highlighting the importance of us as clinicians being able to innovate and use the tools we have available to us. 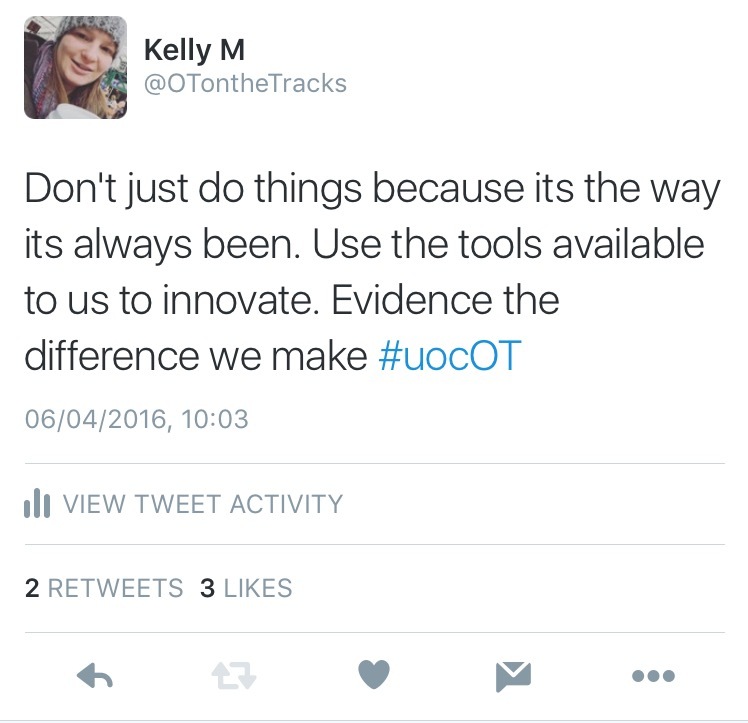 She also highlighted the importance of evidencing the difference we can make as the occupational therapy profession. She also challenged us to think are we to casual in our approach to shouting about what we do? 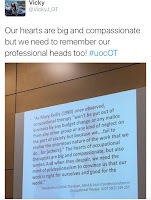 Are we communicating what we do as occupational therapists or where we CAN go in our profession? She also highlighted the importance of networking and sharing, making those connections is key if we are to have influence on a local, national and global level. I took away from this session. Being able to influence the contexts we work within is so important as we strive to utilise occupational therapy to its full potential in benefiting the individuals and communities we can and will work with. We have a responsibility to develop, share and utilise the evidence base within our clinical work and as well as a profession as a whole if we are to communicate the value we can contribute within changing contexts and priorities. 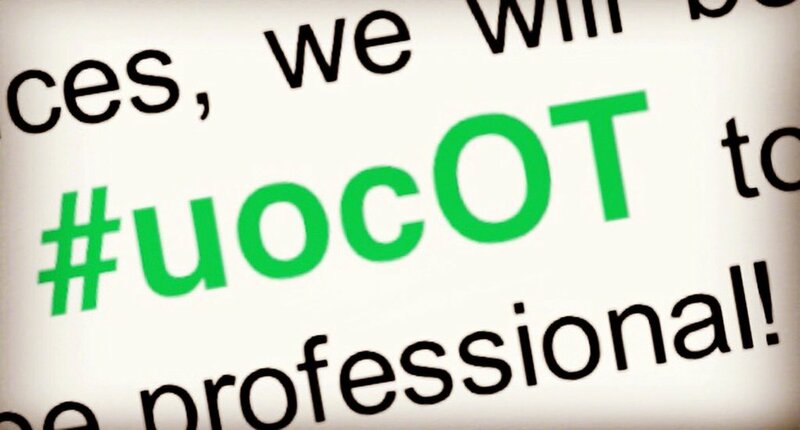 It's always great to hear from occupational therapists that have a large array of experience in a mix of clinical practice, research, as part of the professional body and education as it allows me as a complete novice to see the potential and they huge possibilities there are for me within the profession I am part of. I say this quite a lot in my blog posts, but we really do have some amazing researchers on staff at the University of Cumbria who inspire and share their clinical experience with us. It was great to hear about all the different clinical areas and opportunities Diane has had within her career so far. We are encouraged to say yes to opportunities, even if it feels scary. Just what you need to hear 15 mins before you present your research findings to a group of your peers! 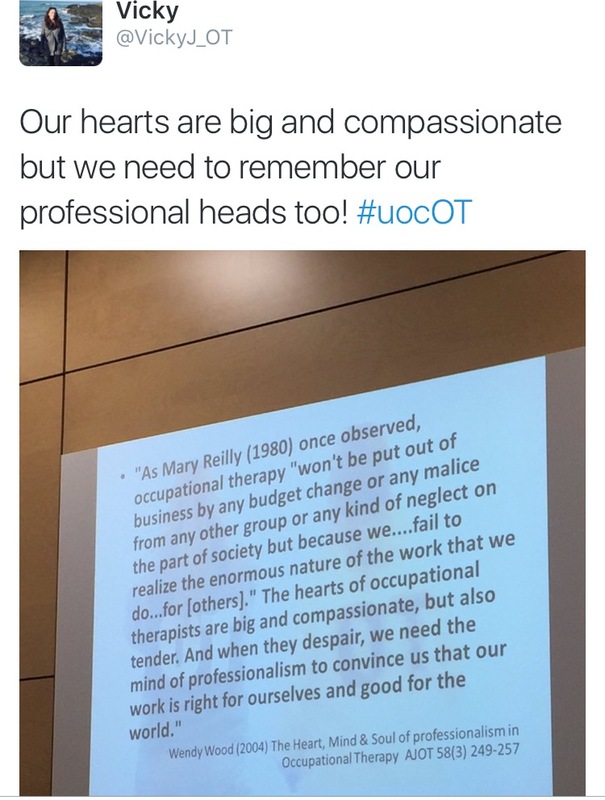 But seriously a key take home message as I begin my career as an OT: There will be opportunities and if we are going to continue to increase the knowledge of occupational therapy within the wider contexts we work within and help impact on policy and best practice we need to be able to be brave and say YES! when we are given opportunities. Apart from it being one of the most nerve-racking things I've done (see previous blog posts on the challenges I have with public speaking), On reflection, it was actually a really positive experience (and I never thought I would EVER be writing that). As this was part of our dissertation module as a formative assessment, our peers and the tutor in the room gave feedback on our presentation and the content, which has been a great way of increasing my confidence that I do actually understand my research findings and can communicate them verbally. 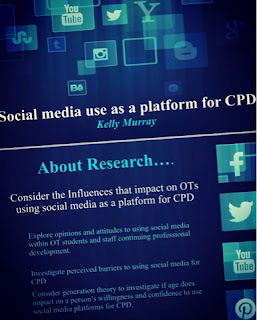 It was a really positive to see on my feedback forms that others could see my passion for the topic, because I had been so worried about actually presenting the content, Im hadn't really thought past getting the words out my mouth, never mind sharing the passion I had on the utilisation of social media within CPD. Lots on learning points on presenting too - such as speaking a little slower and louder, but considering how nervous I felt when i was speaking I think that was almost acceptable at this point. 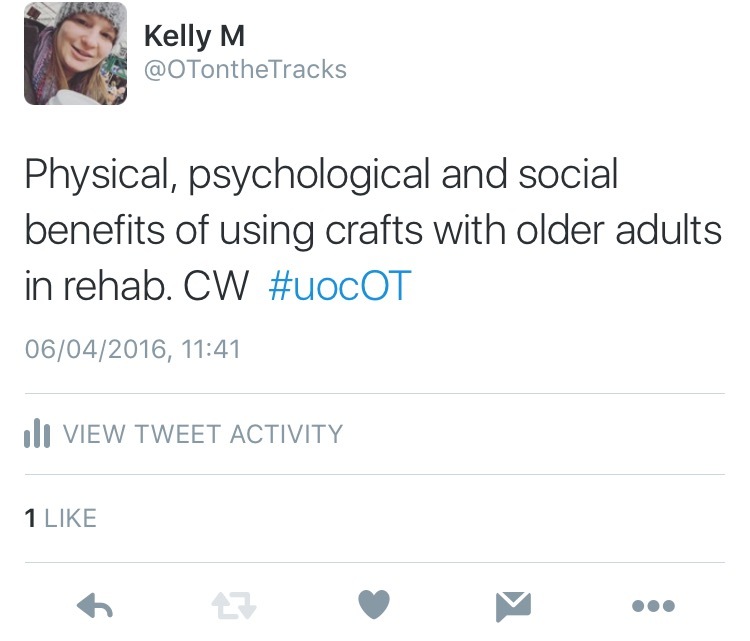 Catrin Williams: 'The benefits of crafts as a therapeutic tool in the rehabilitation of older adults'. This was a really interesting presentation, in that as Catrin has been in my learning set this term, I have had a few discussions with her throughout her research process about how she was getting on with what she was doing. It has always struck me the passion she has for the use of craft within occupational therapy practice. 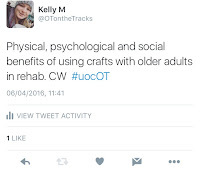 The use of craft within physical occupational therapy does appear to be happening and I think its key that we continue to recognise the therapeutic use to our service users. Take home thought: As long as we as OTs can justify the need to use crafts to benefit our service users, it is still a tool that should be utilised. Graeme was sharing his research on the reasons males choose to study occupational therapy. 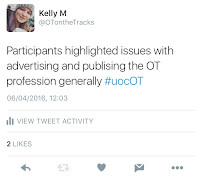 I was interested in this, particularly as I have an interest in the education side of occupational therapy practice. Part of his findings highlighted the lack of knowledge of occupational therapy within male school leavers within his respondents. 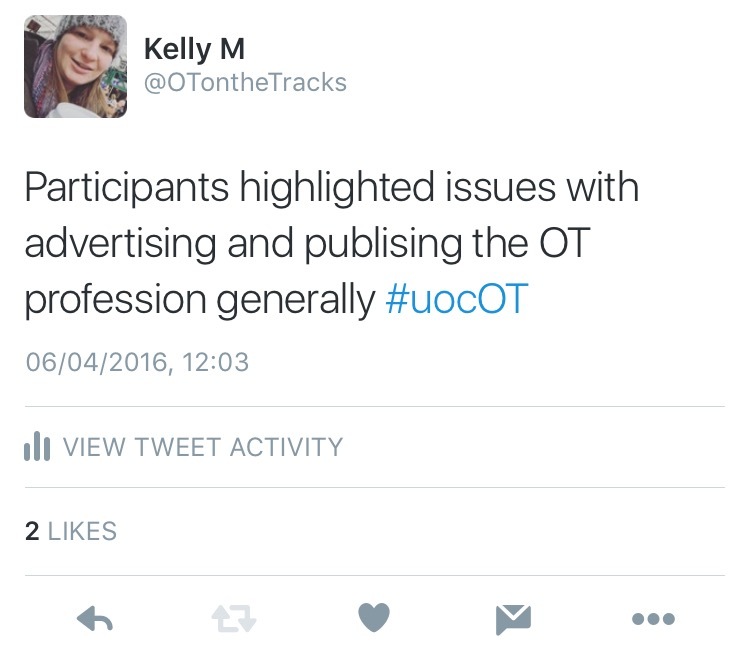 Graeme also highlighted that this may be an issue with the publicity and awareness of the profession more widely. I wonder what impact this has on the people we have both currently and will have in the future, training in our profession. 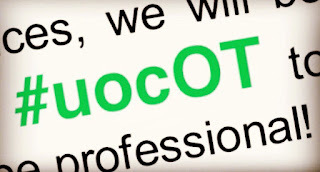 Are we missing a whole host of individuals that have great transferrable and innovation skills, who are simply unaware of what occupational therapy is and what we do? Take home thought: What can I do to improve this as a practitioner? Relating it back to this mornings keynote, who do I need to contact with to influence change, what opportunities do I need to say yes to make an impact on this? Our afternoon keynote was also really enlightening, as it was great to hear about Alan Brownrigg's research journey. It was also brilliant to hear from another messy literature searcher and that was not necessarily seem as a negative. I was really interesting in his PHD research into young people and self harm recovery and i'm looking forward to it being published so that the evidence based can benefit from it. The day was summed up well by Karen, as she again reiterated the importance of research within our practice and the importance of being aware of not just going along with the flow because 'it's always been done that way'. As nearly qualified OTs that can feel like a big challenge... but as evidence based practitioners striving to do the best for our service users, would we want it any other way? Massively proud of the rest of the cohort! We have come so far in last few years. Brownrigg A (2016) ‘Don’t cut me out’ young people, self-harm and recovery'[Keynote Lecture to MScOT Student Conference] HRBO7027: Dissertation. . University of Cumbria. 6th April. Cox, D. (2016) 6 April. Available at: https://twitter.com/dianecox61 (Accessed 06 April 2016). 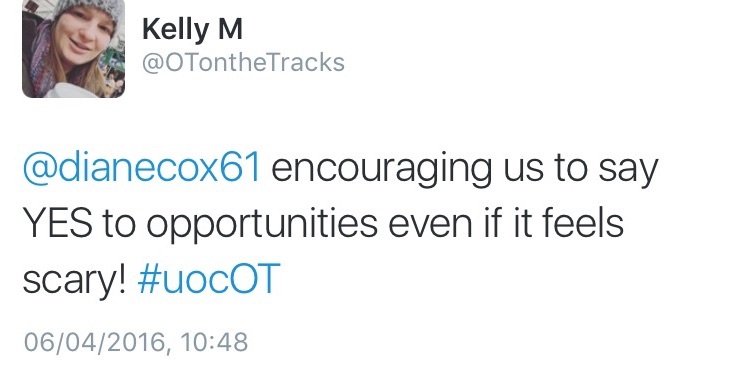 Cox, D (2016) [Post Keynote Remarks to MScOT Student Conference] HRBO7027: Dissertation. University of Cumbria. 6th April. Healthcare Hashtags (2016) #uocOT Transcript (2016) Available at: http://embed.symplur.com/twitter/transcript?hashtag=uocOT&fdate=04%2F05%2F2016&shour=07&smin=25&tdate=04%2F07%2F2016&thour=00&tmin=00 (Accessed: 6 April 2016). 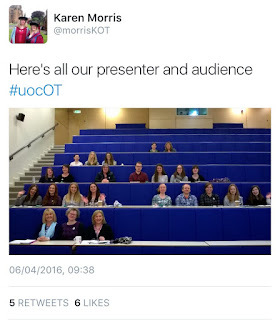 Morris, K (2016) 'MScOT Student Conference: Book of Abstracts and Conference Proceedings', HRBO7027: Dissertation. University of Cumbria. Poulton, G.. (2016) [Presentation to MScOT Student Conference] HRBO7027: Dissertation. University of Cumbria. 6th April. Williams, C. (2016) [Presentation to MScOT Student Conference] HRBO7027: Dissertation. University of Cumbria. 6th April.